I was in Las Vegas with my family and friends for the three-day Route 91 music festival in 2017. On the third night, I met my girlfriends to see the headliner, Jason Aldean, one of my favorites. We were to the right toward the front of the stage, loving the music. Then a few songs in, we heard loud noises. All of a sudden, I felt something explode on my face. It was immediate, excruciating pain, and it felt like my face was on fire. I was in shock. It was mass confusion—22,000 people under fire, screaming, crying. We lay on the ground to take cover. I realized I had been significantly injured, but I could breathe and move my extremities. When there was a break in the gunfire, a friend and I got up to run. We saw the field for the first time—the amount of people who had been killed. People who wouldn’t be returning home to their families. After we escaped, we walked to the Tropicana hotel, and there was hysteria. The sounds of gunfire were still echoing in my head, and I didn’t feel safe. They eventually loaded us into ambulances three at a time, and I ended up at the emergency room. A friend called my husband, Jason, who was in our hotel room. They had to sedate me and intubate me. I lost consciousness. I had been shot in the left side of my face. My jaw was shattered and my chin was fractured in half. I had to have a skin graft from the back of my neck to close the wound. Two major nerves were destroyed. I’ve had nine surgeries and procedures in total. In March, I had a seven-hour surgery to get a nerve transplant from my lower leg, and a bone graft from my hip. In July, I had a six-hour surgery to transplant another nerve from my other leg. It’s been hard to move on in any sense of the term. As soon as I get stronger and feel like myself, it’s time for the next surgery. When I see the scars on my face, it reminds me that I had this horrific experience. But I just had what is supposed to be my last surgery. I feel such gratitude to be alive. I don’t want to let fear consume me. In the beginning, it was a lot worse. I would have night terrors. I was terrified of loud noises and crowds. But I have been given the gift of surviving. Fifty-eight people were killed that night, and that’s a huge weight on my heart. I think about them every single day. There’s a sense of responsibility to get out there and live a good life and make positive differences in this world. 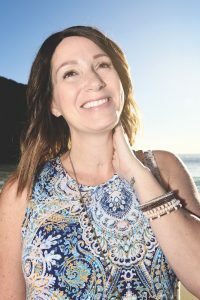 My husband started a Facebook page for me (“I am a Warrior—Natalie Grumet”) while I was in the ICU at the suggestion of hospital staff to keep family and friends updated. Eventually, I started posting my own updates, and it grew into this therapeutic thing. People told me they found inspiration and hope in my story. If it helps people, that makes it easier to go through this journey. When I was 27, I was diagnosed with stage 2 cancer. I felt like I had checked some box and that was the worst thing I’d ever have to go through. But I’ve realized you can never waste a moment to tell people you love them. In those 10 minutes of being under fire, all I could think of was getting back to those people. On that day, one person showed the worst of humanity. And yet since then, hundreds of thousands of people have shown the best of humanity. There are so many good, loving people who want to help, and that will always win over hate.